Living with tetracycline-stained teeth can be a challenge to your self-esteem … and a challenge for your dentist to correct. The reason is those brownish-gray stains caused by exposure to the antibiotic tetracycline took place prior to the eruption of your teeth. As a result, unlike coffee, wine and tea stains that exist on the surface of one’s teeth, tetracycline stains are “intrinsic” stains, meaning they’re within the tooth – in fact, part of its actual makeup. Not all hope is lost, however. There are solutions you can implement in partnership with your dentist that can restore your smile – so let’s take a look at your best options. All staining is difficult to remove. And even lesser staining caused by smoking and food consumption tends to fade instead of disappear. Tetracycline staining, as you might expect, is one heck of a stain to mask given the fact that it’s embedded within the tooth. That said, there are encouraging bleaching products that have been shown to make a difference when used in combination with home treatment, and over a much longer course of time. However, not all patients with tetracycline stains are good candidates for bleaching because quite often the contrasts created after bleaching can cause unwanted differences in luminescence. Your dentist is your best ally in fixing and protecting your smile, so ask if bleaching might be an option you can consider. Cosmetic bonding can be another option to consider. Here, the worst of stains are simply covered up by a tooth-colored filling material. Think of cosmetic bonding as being similar to sculpting. Since it is used most frequently to correct chipped or gapped teeth, when your dentist works with the bonding material, he assumes the role of artist as well as dentist, seeking to restore your smile to its most realistic look, feel and luminescence. Bonding is done by using “white” or “tooth-colored” filling material, and achieves a great color match. Veneers are thin shells of tooth-colored material adhered to the front surface of your existing teeth to improve their appearance. Because veneers don’t usually require as much “shaping” of the tooth as crowns do, they are a strong and attractive alternative that preserves as much of the tooth as possible. 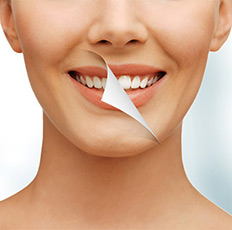 Veneers appear very natural and, unlike bonding, are resistant to staining from coffee, tea or even cigarette smoking. With proper care (which is no different from your standard brushing, flossing and regular cleanings) veneers can last 5 to 10 years, at which point they can simply be replaced. Crowns are yet another option for tetracycline-stained teeth. Unlike with bonding and veneers the placement of a crown means the removal or “shaping” of a significant part of your natural tooth. Since dentists and individuals are inclined to keep a healthy tooth intact above all else, crowns aren’t always the best go-to option. Yet they are an option for some, and their use is dependent on a variety of concerns including whether the tooth is completely healthy, where the staining has occurred (front or back of the mouth), budget and personal preference. With today’s color-matching technology and advanced repair possibilities, it’s no longer necessary to live with a cosmetically challenged smile. Chat with your dentist, like Portland dentist Dr. Travis Agee, at your next visit to see what suggestions they may have for you, and get back to unabashed smiling once again.